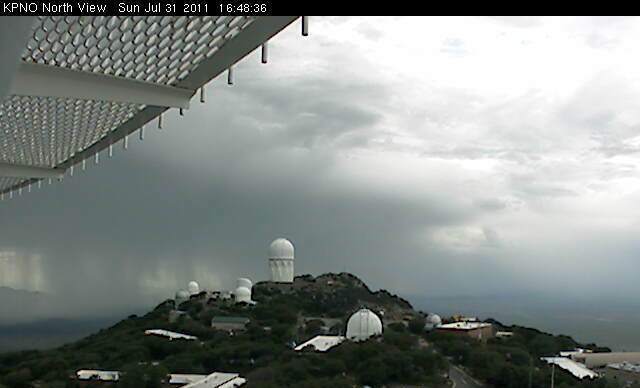 View to north from Kitt Peak at 4:50 pm MST Sunday afternoon 31 July 2011. Current view at 5:30 pm. First a brief summary of yesterday - it was a fairly typical summer thunderstorm day yesterday with small, isolated to scattered storms, wandering around. One small cell tried to delop at dark nearly overhead - we had one rumble of thunder around 8:30 pm MST and a trace of rain. Some nice lightning before dark to the south-southwest. Rainfall amounts were generally quite light. At 7 pm last evening 25% of the ALERT sites had had rainfall, and this morning the coverage for past 24-hours was up to about 45%. 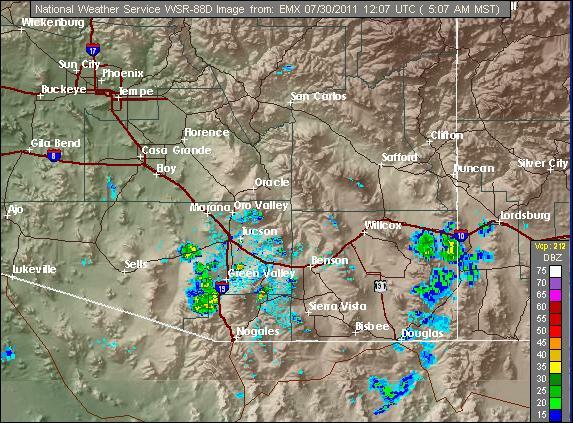 Here in the greater Tucson area 8 of 20 sites had light showers. Across the entire network there were only two amounts greater than 1/2 an inch, and those were in the Catalinas. Rare morning storms today in southern California (where Albert Hammond says it never rains!) - see plots from around 1400 UTC above of radar and surface observations. The Tucson morning sounding (above) shows high PW and an apparent increase in CAPE, which will help support an uptick in storms today. PWs are very high from southern New Mexico westward into southern California. An unusual occurrence at Yuma this morning, as dewpoints jumped into the low 70s as an outflow came in on north-northeast winds! The NAM persists in keeping a remnant 500 mb vorticity maxima from TS Don and brings it to the southeast corner of Arizona today - with a substantial increase in rain chances (see morning NAM precipitation forecast ending at midnight tonight, just above the TWC sounding). The U of A Atmo WRF-GFS model appeared to have initialization problems this morning, so it's hard to compare with NAM today, as it blows up storms in local area by noon and runs them off toward the north-central mountains. The NAM forecasts the strongest 500 mb vorticity maxima over the Southwest to move right up the GoC today - will beinteresting to see if this actually occurs (there is a large morning MCS at the lower end of GoC). 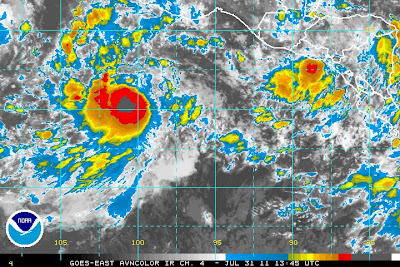 Finally, TD 5E has formed off the south Mexican coast - forecast by NHC to become a hurricane but to stay fairly far southwest of Baja. The above plot shows Tucson - U of A - GPS versus Raob PW for the 0000 UTC soundings for summer 2010. The GPS sensor is on campus about 2 blocks from the NWS sounding release site, so the data are essentially co-located. Each system has its own quirks, so we should not expect exact agreement. However, the hunidity sensor of the NWS RRS sondes is known to be unreliable. The 0000 UTC data from the RRS system were usually dry wrt the GPS data during summer 2010 - some individual soundings had rather extreme differences of a half to nearly a cm - making sounding diagnostics prone to significant errors. Note also that on a small number of days the RRS data at 0000 UTC were wetter than the GPS data. The same plot for 1200 UTC is just above. The agreement between the two data sets is better for the morning soundings. Interestingly, the morning RRS data tend to be more moist than the GPS data - so the morning soundings often have a different character than the afternoon soundings. Some days do have lower PW in the morning - usually when there is deep, elevated residual layer aloft. The bottom line here is that each and every sounding needs to be carefully examined and compared (at sites where this possible) with simultaneous GPS data. My feeling, after watching these data for several years, is that the GPS data are far more accurate than the NWS RRS sonde data. Many thanks to Seth Gutman of NOAA ESRL in Boulder for helping me obtain these data! The Tucson morning sounding agrees well with GPS data wrt to PW. There continues to be a dearth of CAPE at low elevations, even though moisture amounts are quite respectable. Seems like we fought warm middle-level temperatures through much of last summer also. The vertical wind profile is so so, with only strong winds at very high levels. Inverted trough at lower levels seems to stay nearly stationary in model forecasts, while the upper-level cyclone is spinning slowly northward over New Mexico. Not much apparent to latch onto. Some mountain storms, and perhaps some over lower elevations, with small scales dominating the chopped up large-scale setting. 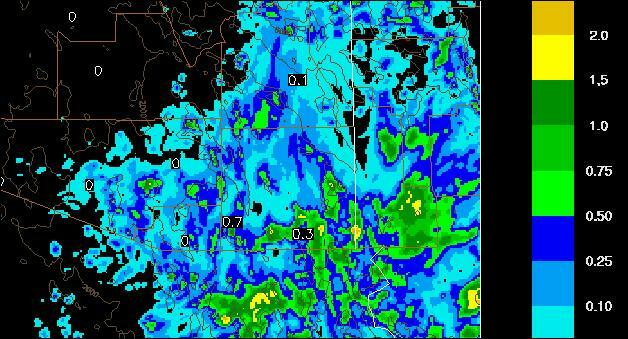 The morning NAM forecast for accumulated precipitation for 12-hours ending at midnight tonight indicates light amounts over all of Arizona. Most significant rain is indicated along south-central Borderlands. Interestingly, the early U of A Atmo WRF-GFS forecast for the same period has rainfall only over the southeast across the entire southern third of state. Amounts are not great and confined to areas east and south of Tucson. So, the two models are quite different again - will one of them be on the money today? We'll wait and watch. It's a nice morning with brisk easterly breezes along the Rillito. View above shows Baboquivari off to south of Kitt Peak. 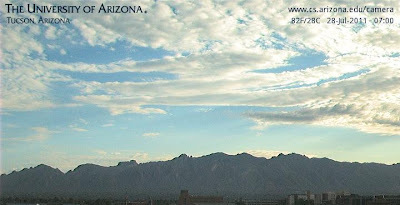 There were some towers bubbling at sunrise and a couple of Cbs off to south-southwest of Tucson. The radar a bit before sunrise is shown below. This is about as good as it got during past 18 hours, so essentially all forecasts for southern Arizona were overdone yesterday. I thought that the early WRF-GFS from Atmo had the right idea with storms late. But they didn't materialize. Strong east winds persisted and a nasty warm layer developed between 300 to 500 mb. It also appears that the inverted trough trough mentioned yesterday was further west than morning observations seemed to indicate - so the NAM initialization wasn't as bad as I thought. Definitely a tough day! Regarding previous post, Mike Leuthold comments: ... plus, what would of a special sounding been able to tell you if the moisture profile was bad? It would of been just another bad sounding to make you more mad! I think that there are several issues worth mentioning here - the first is that the 1200 UTC sounding was badly contaminated and not at all representative of the larger-scale environment that would affect southeast Arizona during the afternoon. So, my pitch is that any sounding data, once the large, deep mass of clouds had moved away, could have been of some use - e.g., wrt the east winds or warm layer. Second, the RRS humidity data, when too dry, are at their worst around max heating time, so there is usually something to rant about with the 0000 UTC sounding here. However, I will note that the new sondes provide apparently excellent wind data and the temperatures seem reliable, except when the sensor or internal electronics are wetted by cloud or precipitation. Would an early afternoon sounding have helped clarify the forecast situation for rest of the day? - perhaps, but we'll never know the answer. Above graphic is 0115 UTC visible image this afternoon. As expected, southeast Arizona has remained mostly suppressed as a new BL developed. There is one strong storm now, down close to Douglas. The latest, 0000 UTC, sounding from Tucson (above) shows that the new BL built up to about 750 mb - quite impressive really. But the sounding above indicates NO CAPE above the new BL. So, this provides a good answer to the question of why isn't more happening? But, what can we believe, as we consider what will happen during the next six hours? The time series plot above for GPS PW versus raob PW indicates that the Tucson RRS 00 UTC data are around 4/10s of an inch too dry. So, is there CAPE drifting around out there, or isn't there? The bad NWS sounding data don't tell us. So, it's a bit of an unknown, and we'll just have to keep watch! A really bad situation, where the miserable sounding data definitely impact our ability to make short-term forecasts! As I wrote this morning - it would have been really nice to get a special sounding from the TUS NWS office today, but no such luck. The Tucson morning sounding (above) indicates that cool, outflow air extends up to around 800 mb and that winds in the cool air remained strong at sunrise. Above the outflow is probably the old BL from yesterday, but it could reflect weak subsidence below the thick cloud based at about 700 mb. Regardless, a somewhat classic "onion" sounding that says little about what the day will bring. Would be a good day for a special, early afternoon sounding here at Tucson. Visible image at 1445 UTC this morning showing the widespread cloudiness, over much of the Southwest and northern Mexico, that further complicates today's forecast situation. Storms overnight in the northern GoC helped to push more moisture northward up the lower Colorado Basin and into California deserts - the outflows were not as dramatic as those over in southeast Arizona. The end result of all this storm and mesoscale outflowing and interacting is that PW now is around 1.75 inches across all of southern Arizona. Another complication is that a leftover MCV seems to be spinning away aove the Safford region this morning. The two upper-air plots (above) are 250 mb and 500 mb for this morning at 1200 UTC. Note that the upper-level cyclone (see earlier posts) is now centered over the Big Bend country of Texas, with a very pronounced circulation. It now appears to be linked vertically with the weak, inverted trough below 500 mb - this part of the system appears to run northward across the New Mexico bootheel. It appears that 500 mb temperatures are distinctly cooler behind (to the east) this feature - so we can hope for an improvement from the current warm -4C over Tucson. The flow ahead of the upper-cyclone will be weak and diffluent, and it appears that any storms that develop will leave their anvils behind as they propagate westward or southwestward - which is good. What will happen today? - there has been enough cooling over Tucson and southeast Arizona that it appears that a new BL will build upward with some capping CIN at it's top. There will probably be CAPE above - although the warm air and MCV aloft make the situation very complicated. New BL days - with CAPE above - can support organized storms when there is decent steering flow and a good outflow kick from mountain storms. The morning NAM forecast doesn't indicate much at all for the Tucson area today. However, the early run of U of A Atmo's WRF-GFS indicates signifcant storms developing over southeast Arizona after around 7 pm or so, and continuing well into the night. It is also of interest that the NAM seems to have initialized the upper cyclone, and attendant inverted trough, quite poorly and has the trough probably too far west. Thus, I view the WRF-GFS forecast as a more likely outcome for late in the day. There was a significant upturn in storm activity yesterday - much more so than indicated by the morning model runs. 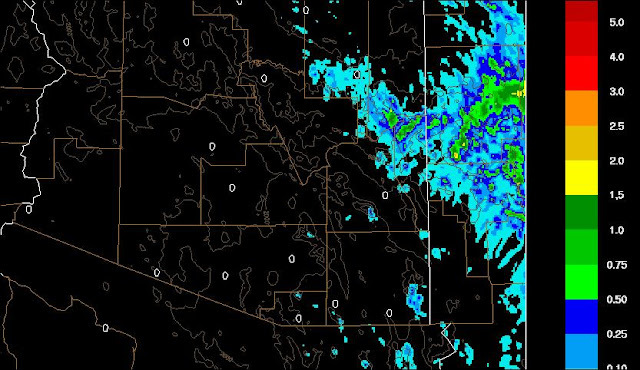 All of the NWS ASOS stations in southeast Arizona had measureable rainfall and 10 of the ALERT sites had rain. Amounts were generally light except in the far southeast corner of state - Rucker RAWS had 0.61" and Douglas had 0.25". The airport and DM carried thunderstorms and light rain before midnight. The IR satellite image and the Tucson radar image (top 2 graphics) at 0130 and 0210 UTC show the large and intense MCS in northern Sonora and the Borderlands. This MCS produced a a very significant meso-outflow that brought cooler air and recycled low-level moisture to all of southeast Arizona. The bottom graphic above is a surface plot from NCAR for 05 UTC (10 pm MST) last evening - it shows the outflow strung out across southeast Arizona. Here at house we had south winds and a smell of rain. Winds generally gusted 30 to 50 mph as the outflow passed observing sites in this part of the state. 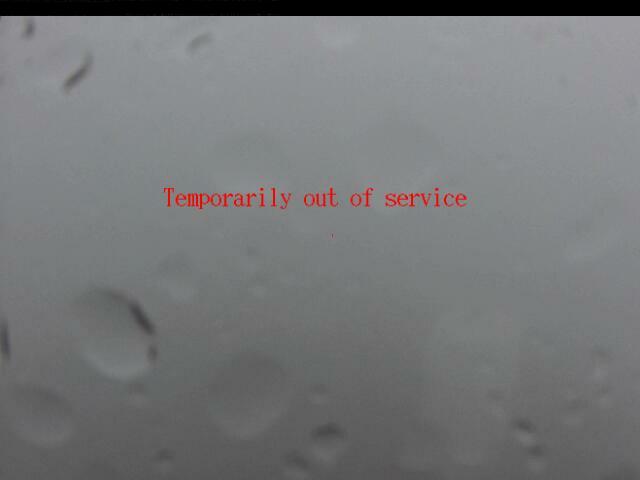 Note that the Atmo weather station appears to have gone down during the night, so nothing to report from there. How Hot Has It Been? Just a quick note - yesterday was the 40th day, since the last week of May, that the high temperature at TUS airport has been 100F or higher. Quite a bit of middle cloud drifting around at sunrise today (see above), with some ACC far off to the north. The visible satellite imagery this morning (below) shows that significant cloudiness has pushed northward from Mexico into southern Arizona. The morning soundings reflect this and PW values are slowly increasing now, with amounts around 1.5 inches. Both the early run of Atmo's WRF-GFS and the 12 UTC run of the NWS NAM indicate another suppressed day over the Tucson region - both models again forecast some storms to the east and south this afternoon. The 500 mb forecast by NAM for 5 pm this afternoon indicates a large, inverted trough extending from the south end of the GoC northward along the Arizona/New Mexico border (see below). I have checked the North American analyses for this morning at the Univ. of Wyoming site - there does appear to be a trough in this region - as evidenced by both the sounindings in Mexico, and the widespread cloudiness. However, winds are very light compared to the afternoon forecast for 500 mb. So, whether or not some mountain storms (there appears to be increased CAPE today for high elevations) try to propagate off the mountains this afternoon depnds upon the strength of the mid-level winds with the inverted trough. Winds at 200 mb are quite strong from the south, so storm anvils should stream off rapidly to the north. The morning 850 mb data indicate a fairly strong, low-level anticyclone over northwest Sonora - this favors gusty afternoon winds from the northwest here. But whether there will be increased moisture with this flow remains uncertain. Thus, some pros and cons for this afternoon - I think the models are probably a bit conservative today, and that there will be some increase in activity. The upper-level cyclone - see previous post - will be affecting our region by tomorrow evening, and both forecast models indicate a substantial increase in storms and rainfall as this feature approaches from the southeast. 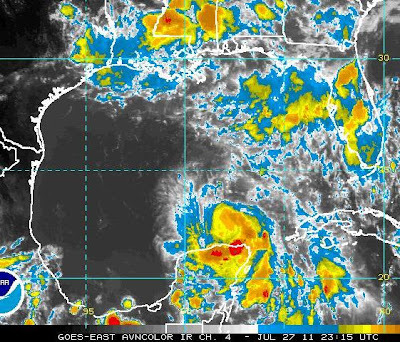 Tropical Storm Don formed last night near the coast of Yucatan. This late afternoon (see IR image above), the storm is in the southern Gulf of Mexico, just north of Yucatan. Don is forecast to move northwestward (considerably to the left of the NAM forecast track) and be a remnant somewhere over Texas by Saturday afternoon (see NHC forecast below). At this time it is too early to tell if Don will have any impacts on southern Arizona weather. However, the NAM forecasts development of a well-defined, upper-tropospheric cyclone ahead of Don. The 72-hour, 200 mb forecast valid Saturday morning (see graphic below) indicates this feature will be near El Paso and that it will clearly be influencing the upper-level flow over Arizona during the weekend - assuming of course that the model forecast is capturing this feature accurately. Yesterday was very suppressed across eastern Pima County, with the only storms occurring off to the east and south, as indicated by the early WRF-GFS forecast at Atmo. None of the 93 ALERT network gauges measued any rainfall. This morning's (Wednesday July 27th) Tucson sounding is even more stable than yesterday's - with essentially no CAPE indicated by the various SPC diagnostics. The eary run of the Atmo WRF-GFS forecasts a very suppressed day over southeast Arizona. Graphic below shows model forecast of total precipitation through midnight tonight. Expect a day of heating and development of a deeper boundary layer. The model forecasts a distinct uptick in storm activity tomorrow, as CAPE develops due to heating and some increase in PW. We are back in Tucson, after being away on travel (Colorado Front Range and San Francisco areas) most of the last two weeks. It appears that only a trace of rain occurred here at house since last Thursday morning - not good, given how much moisture there was over southeastern Arizona. A very nice example of how abundant moisture need not translate into rain at a given location down here in the summer. There are many other factors at play - CAPE, vertical wind profile, amount of solar heating, outflows and etc. Naturally, most parts of the local area fared better than we did here at house. Yesterday was fairly supressed, especially at lower elevations. Almost 30% of the ALERT stations measured rain during past 24-hours, but these were mostly the higher elevation sites. Only 20% of the Greater Tucson sites had very light amounts of rainfall (< 1/10 inch). The composite radar chart from NCAR (above) for 2 pm MST yesterday (July 25th) indicates the general low degree of storm activity. But note that this product displays base-scan reflectivity, which can be quite deceptive in our area. Highest amounts of rain I noted were 1.04" at Keystone Peak and 0.63" at Manning Camp. 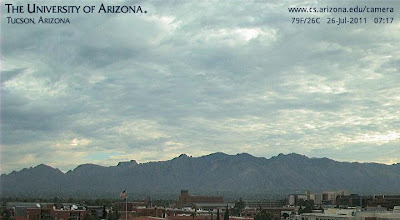 The two webcam photos above show the views looking north, from the U of A campus and from Kitt Peak, at a bit after 7 am. Heavy middle cloud cover is drifting around over metro Tucson, while skies are quite clear out at Kitt Peak. This reflects a fairly pronounced decrease in PW from Tucson westward, as drier air is inching eastward on west winds associated with another Pacific trough that is moving across the far West today. So, looks like we've returned for just in time for a further decrease in storm activity. Finally, the Tucson 12 UTC sounding this morning (above from SPC) exhibits little potential CAPE for the afternoon at low elevations. Winds remain quite light and are now westerly below 400 mb. Ignore the SPC Tv lifted parcel from the surface - it is completely irrelevant - but note that mixed layer CAPE is only 113 m2/s2. To the northwest at Phoenix this morning, mixed layer CAPE is zero. The U of A Atmo midnight run of their high-resolution, WRF-GFS model indicates that Pima County will be very suppressed today and tomorrow, with activity forecast to remain east and south along the borderlands. So it goes as July heads toward August. 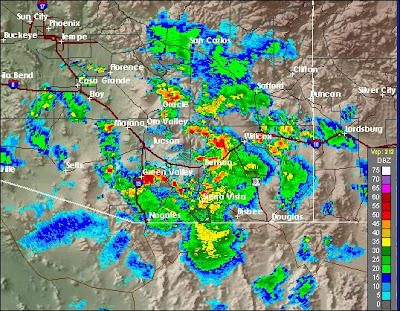 After a couple of mostly suppressed days, there was an increase in storm activity yesterday, However, storms from the Vail area skirted to the south parts of Tucson and then lined up for awhile out to the west. The Alert network had 40 stations with rain and 7 of these had more than an inch. Today's (Sunday July 24) Tucson sounding indicates a poor vertical wind shear profile (the 250 mb anticyclone is poorly positioned and the profile had become uni-directional by last evening), but with continued high moisture and moderate CAPE. There appears to be substantial elevated CAPE, which will favor storms, even though the surface laer is now quite cool. Zone of activity today should extend west to the coastal mountains of Californis - San Diego sounding has CAPE above the maritime surface layer! More heavy rain and wet microburst activity,but storms may move erratically, given the lack of well-defined steering flow. A brief post this morning (Saturday July 23, 2011). The anticipated GoC surge arrived in Yuma around 10 pm last evening - see previous posts re Dora and the associated surge. 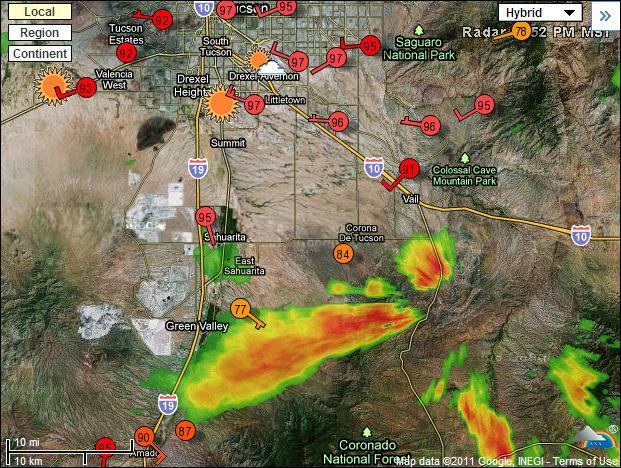 Dewpoints jumped in Tucson early in the evening, as outflows (no storms or rain) moved across the area from the south. This morning's Tucson sounding is very moist, with moderate CAPE, and a reasonable shear profile to support propagating storms into lower elevations. The cooling from last evening's outflow appears to have been shallow and not too great. There is much cloudiness around and to the south, so amount of solar heating may end up a bit restricted. But overall, an excellent day for significant storms with heavy rains and some severe winds moving into low, desert elevations. Situation through Monday will evolve day-to-day and be heavily dependent on what happened previous day, as well as the changing vertical wind profile. A very interesting weekend on tap! Heavy storms at dusk produced large rainfalls in the nearby moutains and some of the northeast metro area. Strong outflows moved across the metro, but storms didn't do much over central parts of town. We had 30 to 40 mph gusts here, lot of lightning and thunder, but only 0.03" of rain. I've shown the two eastern most subsections of the Pima County ALERT network above - 24-hour rainfall ending at 6:30 am this morning (21 July 2011). There were 18 reports of an inch or more, and manning Camp in the Rincons had over two inches. 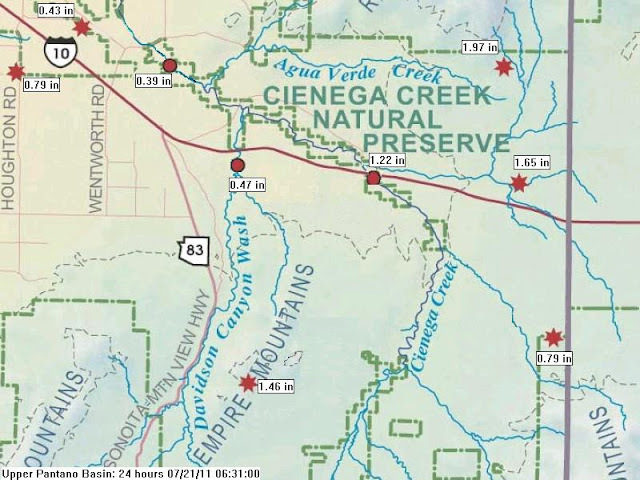 Many road closures this morning due to washes flowing. Outflows Into Tucson Area Again This Evening? 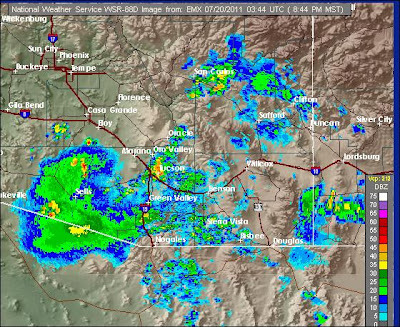 The above graphics (visible image, composite radar, and WunderMap surface plot) are for 5:30 to 5:50 pm MST - it appears that Tucson is surrounded by thunderstorms early this evening. It has heated up nicely this afternoon, with northwesterly winds prevailing. So the big question for this evening is whether or not outflows will again move into the metro area, and if they do will they trigger new storms? Too soon to tell for sure, but appears to be a good possibility. 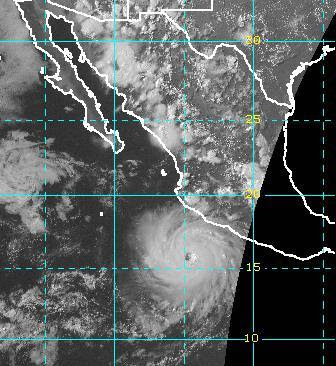 Visible satellite image (above) shows Dora off the southwest Mexican coast at 2330 UTC, 20 July 2011. the latest NHC statements indicate that Dora is now a Category 4 hurricane, after intensifying rapidily during the day today. Thus, Dora is the second Category 4 hurricane of the 2001 season in the eastern Pacific. The current NHC track forecast for Dora is shown above. The forecast is now indicating that Dora will cross north of 20 N on Friday morning - considerably faster than the earlier forecast (see first post on Dora). If the forecast track for Dora proves accurate, then I anticipate a significant GoC surge of low-level moisture into Arizona on Friday night or Saturday morning. Have to go to an appointment, so only the briefest look at today. The TWC morning sounding (above) indicates L/V winds through the depth of troposphere. This means that forcing will be due to heating over the mountains, and then small scales will determine the evolution after initial storms. The sounding indicates PW above 40 mm with BL still reaching to 700 mb. There appears to be considerably more CAPE available today at all elevations. It looks like an excellent moist microburst sounding - so, winds and R+ a threat for where storms develop. Will they propagate into lower elevations? The Atmo WRF indicates a down day at low elevations, keeping rainfall down in the borderlands - the NAM appears somewhat similar. With better CAPE, but almost no winds, this afternoon and evening appears to be a wild card,perhaps better than the models indicate. Note that there may have been problems with the WRF run, and that there is heavy morning cloud cover, which will delay heating. Tough forecast today. 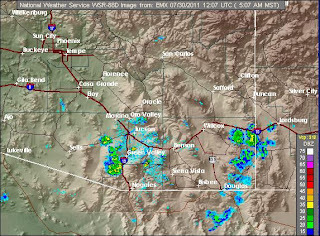 Thunderstorms developed nearly overhead around 8:30 pm MST last evening and lasted until around 10:00 pm. Considerable lightning and thunder here with moderate showers - total rain at house was 0.35", while several ALERT gauges just to the east had amounts approaching an inch. 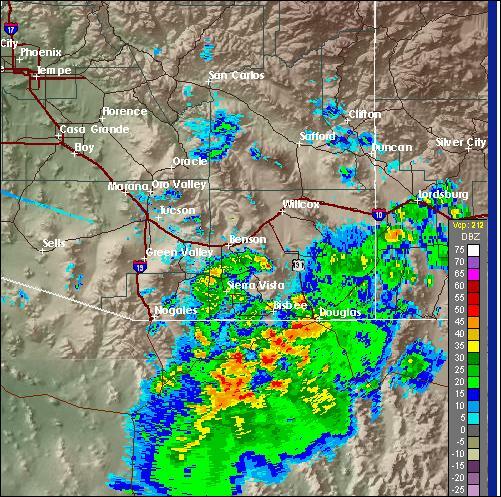 A strong outflow from the south moved into Tucson around 4:00 to 5:00 pm yesterday afternoon - produced by a cluster of strong storms over the Santa Rita Mountains that had then drifted westward. The outflow appeared to stall over northern portions of the city, e.g., it's passage here wasn't very noticible. Winds at Casa Grande remained west to west-northwest until after 9 pm. The RAWS station at Saguaro had a slight shift to south winds, but then returned to west to northwest winds by 7:00 pm, followed by an outflow from the east around 8:00 pm. The airport, Atmo, and DM also had an outflow from the southeast to east as the storms were developing. Radar image above shows the storm echoes at 8:44 pm. We first heard thunder here a bit after 8:30 pm. Bottom line is that substantial mesoscale convergence occurred over central Tucson around dark, triggering the storms. At 7:00 pm last evening only 10 of 93 ALERT stations had had rainfall. However, this morning 54 sites report rainfall, with 7 sites having more than 1/2" an inch. 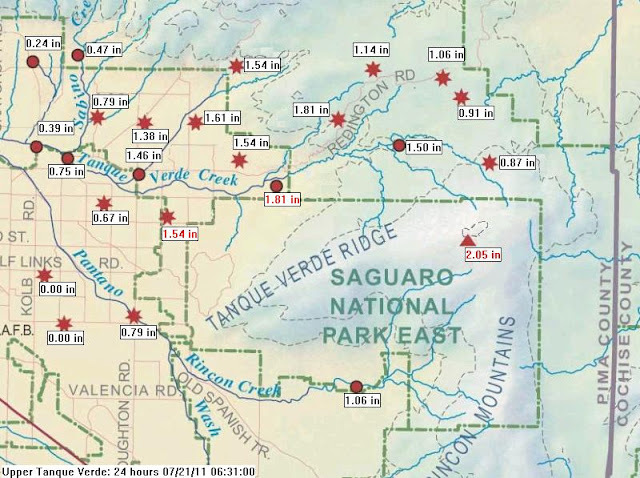 The ALERT gauges in Greater Tucson had rain at 19 of 20 gauges! So, a nice late event, driven by local convergence resulting from earlier, higher elevation storms. The evening Tucson sounding had a BL reaching to just above 700 mb, but with only the slightest sliver of Tv CAPE (see SPC analysis top above). However, in comparison to GPS PW data, the sounding was at least 2/10 of an inch too dry - thus, there was actually more CAPE present than indicated by the RRS sounding data. Yet another example of how the bad RRS soundings can adversley affect short-term forecasts. This morning there is much cloudiness around the west side of the central US anticyclone, primarily affecting eastern Arizona at 1430 UTC (above). There are some light showers associated with the cloudiness. There was another dust event in the Phoenix area yesterday. 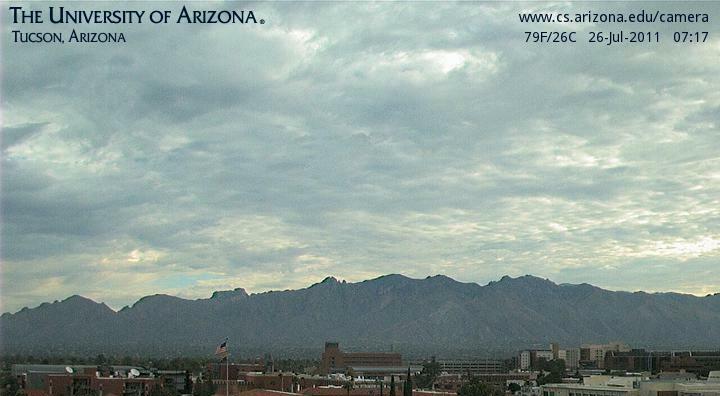 Low-level moisture has yet to show up in southwest Arizona. Storms yesterday produced mostly wind and dust (gusts of 30 to 50 mph were common) at lower elevations, with heaviest rain amounts in and near mountains. A bit more than 60% of the ALERT gauges had rainfall, with 5 sites having more than 1/2 an inch. 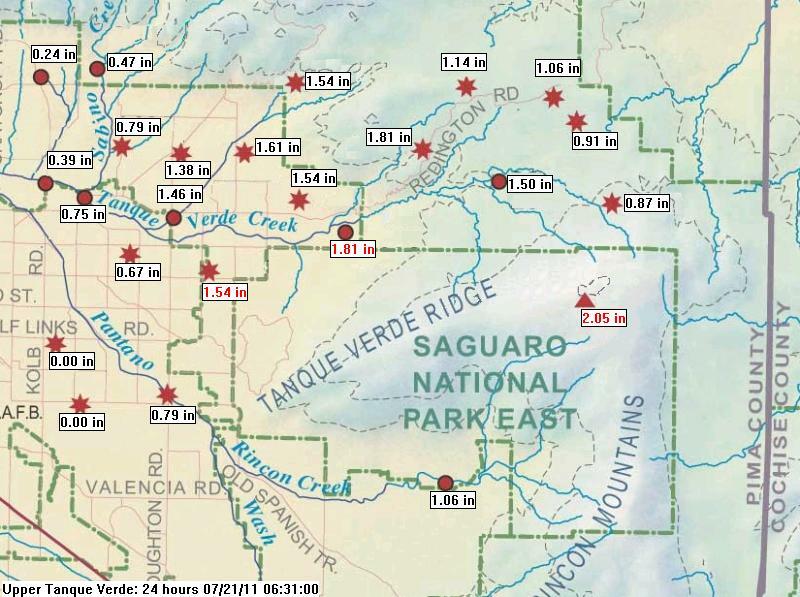 The greater Tucson gauges had 25% coverage with the greatest rainfall amount at only 0.12". Here at house we had light showers around 2 pm MST, but with only a Trace of rainfall - didn't observe lightning or thunder here. The morning sounding at Tucson (above) appears slightly more moist at low levels (PW values are right around 1.5" across southern Arizona), but still with limited CAPE at low elevations. Winds have weakened through most of the troposphere, with no substantial steering flow peresent. Mountain CAPE again appears to be considerably greater than that at low desert elevations. So, there appears to be a greater threat of heavy rains over higher elevations today, since storms will probably just wander around, moving toward nearby unstable air. The U of A Atmo version of high-resolution WRF model did quite well yesterday, and it appears to be forecasting pretty much what is written above for today. 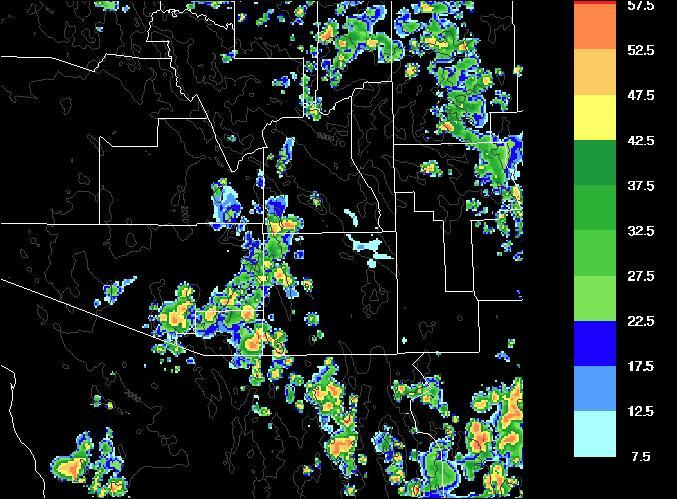 The WRF-GFS run from midnight predicts storms over the mountains around Tucson by 2 pm (top graphic is composite radar forecast). The cloudy area this morning has convection, but later in afternoon and evening (note that the model did foreast the morning clouds and showers quite well). Bottom panel shows the forecast of total rainfall amounts by 10 pm tonight. Another Big Storm Day - Today Or Tomorrow?